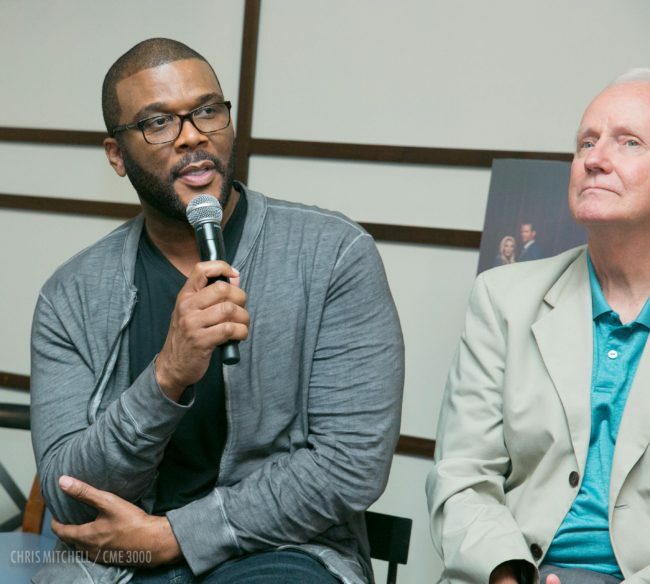 It fascinates Tyler Perry to create programming structured around people and what results from their choices. The dynamic actor, writer, producer, playwright and director’s latest small screen foray, Too Close to Home, is a dramatic series on TLC spanning eight episodes centered around a young woman (Danielle Savre) who abandons her family and trailer park origins for a new life on D.C.’s political scene. She fabricates coming from an affluent background but is forced to relocate back to her small town roots and confront pressing family issues following her sordid, headlining tryst with a reputable politician. Quietly resting his face on his left hand throughout the advanced preview, Perry, synonymous with creating and portraying the girthy, hell-raising, pistol-slanging matriarch, “Madea,” got his creative inspiration for Too Close to Home from admiring the work of veteran television producers Aaron Spelling and Norman Lear. The primetime series’ ensemble (and predominately white) cast features Heather Locklear, Matt Battaglia, Trisha Rae Stahl, Kelly Sullivan, Brooke Anne Smith and Brock O’Hurn. The modest, self-assured New Orleans native responsible for producing high-grossing box office smashes such as I Can Do Bad All By Myself, the Why Did I Get Married? series, Daddy’s Little Girls, The Family That Preys, For Colored Girls, Good Deeds and Temptation: Confessions of a Marriage Counselor wastes no time acknowledging and praising his cast’s professionalism and humility. The 46-year-old creator, humanitarian and fast-paced showrunner behind House of Payne, Meet the Browns, The Haves and the Have Nots, Love Thy Neighbor and If Loving You is Wrong, watched every program on TLC while he was negotiating Too Close to Home. Perry extracted certain attributes and dramatic elements from each program on the cable network to concoct the series. Shot entirely on the media mogul’s newly developed Ft. McPherson production lot, Perry shares post-screening that he recruited a new cinematographer and constantly renovated numerous sets on the studio’s 330 acres (i.e. the Oval Office, trailer park and a farm) to give TLC’s first original scripted program more lush production aesthetics. Oprah, Perry’s ally and close confidante, he says, is as equally as excited and supportive of Too Close to Home as he is. The humorous thespian and groundbreaking studio owner is not concerned about the race or ethnicity of the performers on any of his programs. He aspires for Too Close to Home, already renewed for a second season, to generate similar fanfare as The Haves and the Have Nots.